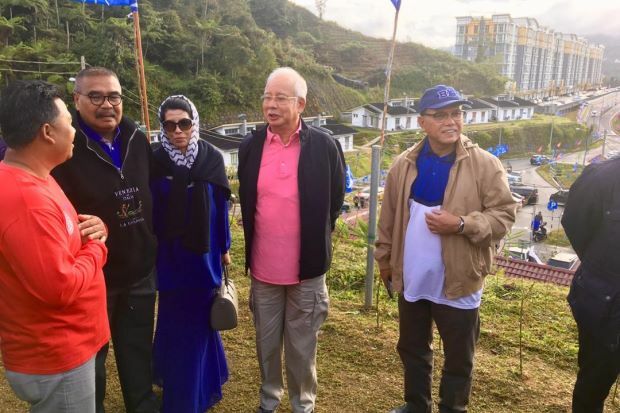 An "ordinary" looking Najib (centre) during the Cameron Highlands campaign. A LAWYER who’s often in the news recently alluded to the support former prime minister Datuk Seri Najib Razak appears to be having with Malaysians in general, describing it as something very worrying, given that Najib faces 42 counts for graft and abuse of power. Datuk Ambiga Sreenevasan was also of the view that this scenario would be unheard of elsewhere. Wrong. Najib recently took the first few steps to court in what should be a journey that could last maybe 8 years at least but let’s not pretend – in the court of public opinion, certainly with the urban middle-class — this 66-year-old from an aristocratic family in Pahang is guilty as hell, being called simply and plainly a thief from the country’s number 1 to so many down below. But despite all the tons of bricks piled on him, it’s amazing really how this man who was prime minister for almost 10 years should appear so unfazed and unruffled in public despite those charges in a scenario previously unheard of in Malaysia. His public demeanour is as if he is so sure he will not be found guilty, despite all the negatives about him from the last couple of years of his being in office until today. Strange in fact to think that Najib has never looked more relax after his long involvement in politics and that’s going back to 1976 when he took over the seat that was vacated after his father’s death, with the explicit support of the Pahang palace. I always thought that when speaking before a political audience he tried too hard to the point of straining himself, the veins in his neck looking as if they were going to burst anytime soon. Negative though the perception may be but the thing about people in a leadership position, especially politicians, is that they do have a decent following, mainly due to the good they have done to their supporters and loyalists. The negatives others talk about do not matter a hoot to the believers. Understandably, the purists find this most objectionable. Notorious gangster, the late Botak Chin, was said to be popular with the Chinese community and in particular the working class in and around Sentul due to his generous ways as a modern day Robin Hood. He was high on the police wanted list and was eventually executed in Pudu Prison in June 1981 for his crimes. Thus despite his notoriety, Chin was loved and adored by some. There were also negative talk about the links between the late Selangor mentri besar and former Umno Youth leader Datuk Seri Harun Idris and big time business interests but this mattered little too to his loyal band of diehard Malay supporters. 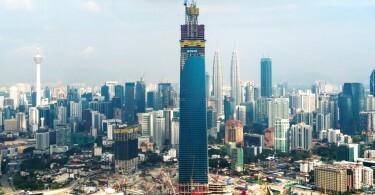 To the squatters in Kampung Kerinchi, Abdullah Hukum and other mainly Malay suburds of Kuala Lumpur, Harun was their saviour and godfather who shielded them from punitive action from local government. You can say the same about the late Tun Datuk Mustapha Harun, Sabah’s chief minister from 1967 to 1975, Sukarno of Indonesia and Ferdinand Marcos of the Philippines. Or tell the millions of Thais in the country’s north and impoverished northeast that former prime minister Thaksin Shinawatra was a good for nothing man who abandoned them to live a luxurious life overseas and how many would agree with you? To these mainly underclass Thais Thaksin was the prime minister who made life easier from them by providing easy-term credit facilities. The last I checked a few days ago Najib had 3.7 million followers at Facebook and 4.2 million at Twitter and while it’s safe to assume that not all of them support him, most would and that’s a big enough number that his detractors would do well not to ignore. He is the undisputed king of social media platforms in Malaysia and much was acknowledged by commentators of his influence in recently helping Barisan Nasional retain the Cameron Highlands Parliamentary seat. And he wasn’t even officially in the BN campaign team, was not photographed with the BN leaders who were there and no one amongst them made any reference to him as being one of their own. Ironically in was during a few by-elections ago that Umno leaders he had given positions to who expressed their objection to the “tainted Najib” being involved in BN’s campaigns. That he reinvented himself in Cameron Highlands was there for all to see, moving around in every which way but the tried and tested official way. He was like a one-man political juggernaut. The next by-election is scheduled for March 2 in the state seat of Semenyih, unless of course a court rules in favour of a suit by a voter to ask for a postponement. Semenyih is a Malay majority seat and for a long time was under Umno/BN except after last year’s general elections. With Pakatan Harapan still struggling to get its act together and having to deal with one negative after another and being slayed from many sides for its failure to deliver promises outlined in its election manifesto and not a sniff of the many promised institutional reforms, there is every likelihood that BN may yet cause another upset, with the help of PAS, and yes, Najib. The problem with Pakatan is that it doesn’t appear to be able to work out what its liabilities are although it has been 9 months plus since it took over control of the federal administration from BN. Every mis-step means a gain for BN and under these circumstances, people are quick to forget why they had booted out BN. Najib may be the most unpopular Malaysian among the urban middle-class but he looks like an individual that is still to be reckoned with it in a sub-urban or rural constituency, where people are more simple-minded and care more about who is perceived to have done good for them. Given the economic issues the people continue to face and deal with, the working class still sees Najib as the man who did much to give them a decent life and this has nothing to do with integrity or about taking the high moral ground. It’s about life’s bread and butter story.